Artwork Panel: 32.5cm x 134cm ≈ 12¾" x 52¾"
Silk/Brocade: 41.6cm x 190.5cm ≈ 16¼" x 75"
Width at Wooden Knobs: 50.6cm ≈ 20"
Joshua 24:15 (KJV) And if it seem evil unto you to serve the LORD, choose you this day whom ye will serve; whether the gods which your fathers served that were on the other side of the flood, or the gods of the Amorites, in whose land ye dwell: but as for me and my house, we will serve the LORD. Joshua 24:15 (NIV) But if serving the LORD seems undesirable to you, then choose for yourselves this day whom you will serve, whether the gods your forefathers served beyond the River, or the gods of the Amorites, in whose land you are living. But as for me and my household, we will serve the LORD. This scroll just dwells on the last line of the verse, "...as for me and my household, we will serve the LORD." We used the only official Christian Chinese Bible that I know of so that the translation would be as accurate and standard as possible. Any Chinese Christian worth their salt will easily be able to identify this verse from the Chinese words on this scroll. I think it is a bit like having a secret code on your wall that quietly expresses to whom your are faithful. A great gift for your devout Christian or Jewish friend if they happen to be fond of Asian art. Or perhaps a wonderful "conversation starter" for your own home. 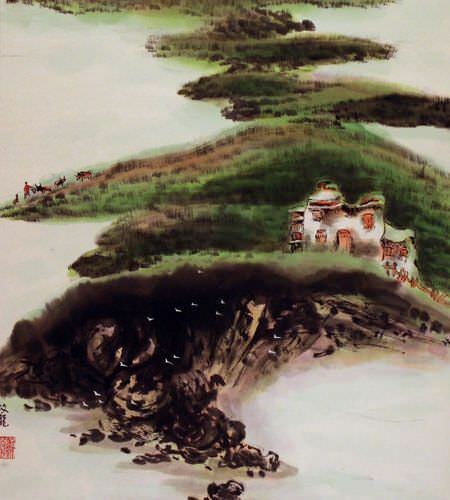 This piece is painted with special Chinese ink on xuan paper (rice paper) mounted to a traditional gold-colored silk wall scroll. This is beyond our normal offerings as it also has polished hardwood knobs and a solid-wood roller - the same knobs are used by the Palace Museum in Beijing for their finest artwork and calligraphy. This calligraphy was done my Master Calligrapher Xing An-Ping of Beijing. This particular scroll is offered at a special low price. The low price has to do with the fact that we had the calligrapher do a series of these, because it is a very popular title. If you would like a different Bible verse created for you on custom wall scroll, please post your request here: Bible Verse Requests for Custom Chinese Calligraphy Wall Scrolls If you just want a very short Bible verse in Chinese, the cost is $49.88 for a custom scroll. But if it's as long as this one from Joshua, the cost is $69.88 ($40 more if you want it done by Master Calligrapher Xing An-Ping). 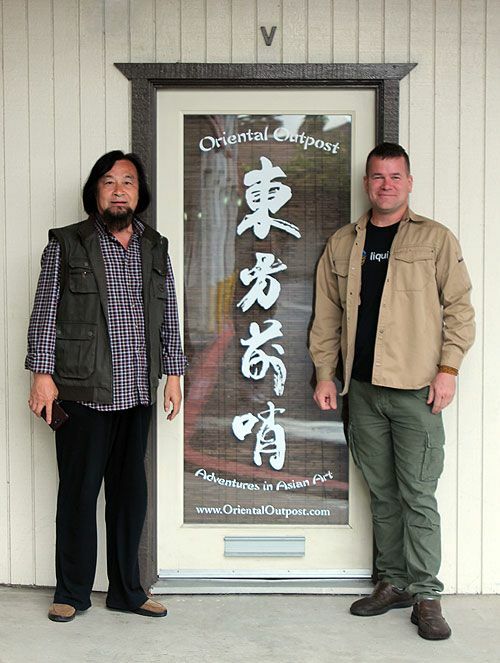 Xing An-Ping and I in front of my studio door in California, 2016. He wrote the calligraphy for the logo on my door. This was during a trip when Xing An-Ping, his wife, son, daughter-in-law, and grandchild came to visit and vacation with us in the USA. As we came out of the Chinese New Years holiday in February 2017, I got a message from Master Calligrapher Xing An-Ping that he had been admitted to the hospital with a probable case of pneumonia. A couple weeks later, he informed me that the diagnosis was leukemia. All of us were quite shocked. 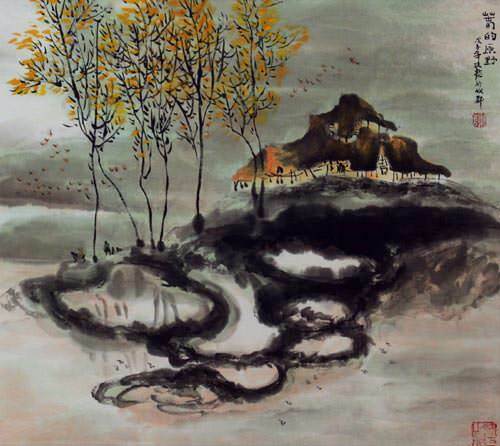 However, Xing An-Ping indicated that he fully planned to write calligraphy between his weeks of chemotherapy. I knew the future might be bleak, but I expected that difficult future was a few years away. On April 8th, 2017, I received a message from his wife. Xing An-Ping passed from this life and started his journey to the next. His death is a huge shock. I am proud and honored to have been able to call myself his friend for the past 12 years. We were so close that my family and his vacationed together just last year in California. 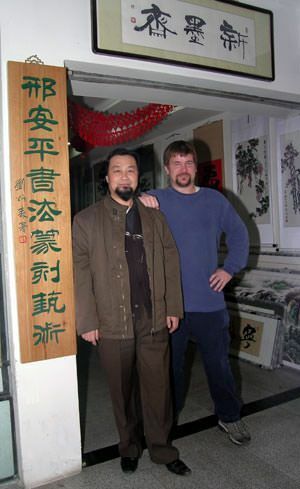 I learned so much from him, and he provided my customers such great calligraphy all these years. He would occasionally mention how very satisfied he was to know that his artwork now hangs in the homes of people in roughly 65 countries around the world. And now that calligraphy is his legacy that lives on. This loss is so great that I am having trouble even articulating just what this means to myself, my wife, and my small staff at Oriental Outpost. The artists that I work with in this business have always felt like family to me, perhaps now more than ever. 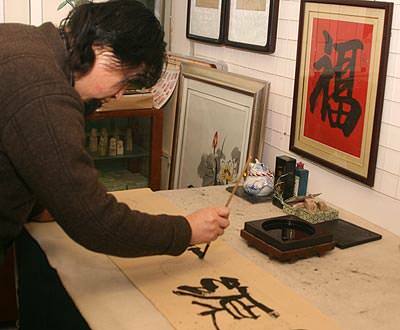 Master Calligrapher Xing An-Ping is a famous calligrapher in Beijing. He's been published and interviewed in magazines numerous times. In Beijing, a city known for its high level of scholarship and calligraphy, Xing An-Ping is rated in the top 200 living masters of calligraphy. Master Xing is not only an expert in nine different Chinese scripts, but also can write any of more than 40,000 characters in the Chinese and Japanese lexicons, including alternate forms, without reference to any books. This is very rare, as most calligraphers must consult special reference books to find rare and alternate forms of many characters. Most literate Chinese people of this generation can only read 5000 characters, and perhaps write 3000 of them without reference. His belief is that art is more important than politics. Therefore, he is more than willing to write Japanese words and phrases. This is rare for a Chinese calligrapher, as most still hold strong distaste for Japan due to the atrocities in Nanking (Nanjing) before and during WWII. He believes that all religions should be respected. While he sees himself as a Buddhist, and meditates before writing all of this calligraphy, he carefully creates Christian, Jewish, Muslim, and other religious calligraphy artwork upon request of customers in China and around the world. Unlike many or most Chinese men, Master Xing does not smoke or drink. He eats mostly vegetables and not too much meat (Yes, contrary to popular belief, many Buddhists do eat meat - in moderation). His healthy lifestyle is probably why he is in his late-50's, but looks like he is 40. He speaks in sophisticated Chinese - they way you expect a doctor or professor to speak. My Chinese is at about the level of a 3rd-grader, so he has to "dumb down" his Chinese when he and I have a conversation. 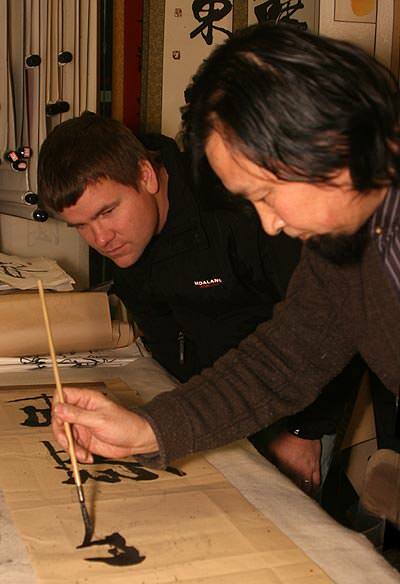 Master Calligrapher Xing An-Ping filmed for the 2008 Olympics by NBC. When I met Master Xing, in early 2005, I had already looked through the studios of almost 100 top-rated calligraphers, in search of the one I wanted to work with (a process that took two years). I liked the quality and styles I saw in his studio, and we sat down to talk. I told him of my plan to bring very personal and customized Chinese calligraphy to the masses. We talked about catalogs of high-level calligraphy that sells for $2000-$5000 for a single wall scroll. This is fine for a collector of Asian calligraphy, but it puts it out of reach of the common people. I told him that my plan was to offer a beautiful product at an affordable price, while at the same time, educating people about calligraphy and Chinese culture. 1. His artwork being displayed in over 60 countries around the world. 2. His part in providing education and knowledge about this special art. 3. The fact that I was going to potentially keep him busy with lots of interesting projects. The final philosophy is, "The legacy of this artwork far outweighs the money received for creating it". I also found a kindred spirit with Master Xing in the fact that he cares as much about quality as I do. I've always been picky about quality, and thus spent years searching for the best scroll maker in all of China. When I found him, I helped him set up the best mounting workshop ever. We even imported special saws from Sweden, had huge custom glass-top tables made, and recently bought the largest and best artwork press that they make. Before Master Xing would work with me, he sent me away with a piece of his raw calligraphy to have mounted as a scroll at our workshop. Master Xing had his own favorite mounter, and knowing the quality issues (or lack there of), he wanted to make sure his artwork was going to be mounted using the best materials and craftsmanship. When I brought the scroll back a few days later, he said, "Wow, this is better than mine". He now gets his own artwork for domestic sale at his studio, mounted at our workshop. in my appreciation of Asian calligraphy. moves and pauses his brush can be mesmerizing.